Released last year, the game Assassin’s Creed Unity, in the Assassin’s Creed series by Unisoft, is set in Paris during the Terror. “Point and click” is about my limit as far as gaming is concerned, but I love this game's beautiful recreations of Revolutionary Paris. 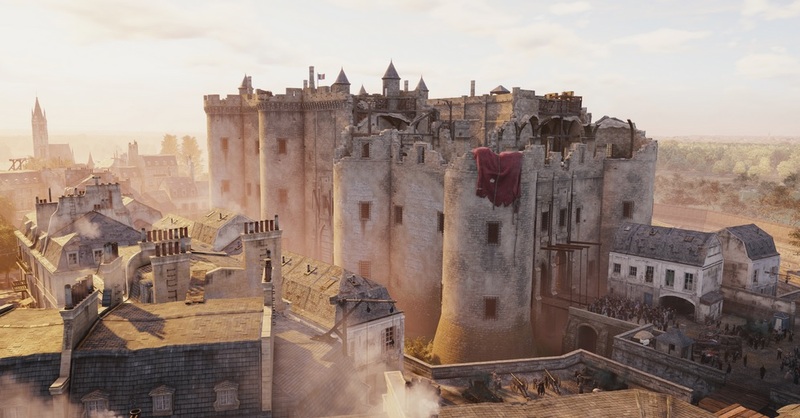 Ubisoft aimed for "real-world scale" in the central section of the game. About a quarter of the buildings are playable - meaning your character wander (or creep, run and leap) around them and move seamlessly from outdoor to indoor scenes. The effect is really impressive. According to Art Director Mohamed Gambouz, who is based in Montreal, the idea was not to provide total historical accuracy but a Paris of the imagination, the "postcards people have in their minds". Nonetheless considerable effort was spent in recreating the historical city. Designer Nicolas Guerin spent three months poring over more than 150 old plans. Numerous iconic landmarks – Notre Dame, the Hotel de Ville, place de la Concorde, the catacombs - were lovingly reconstructed. Caroline Miousse, artist on the project, took two years to model Notre Dame alone. 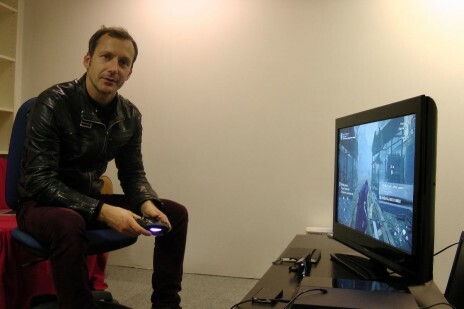 Ubisoft even toured Paris to compare the gameplay video on a tablet to the real life monuments. There are street signs although these were only introduced to Paris fifty years later. To offset these creative liberties and create a feeling of authenticity, the designers worked to add an impressive wealth of accurate historical detail. They employed several staff historians; Maxime Durand work on the tiny details of wall hangings and costumes which players hardly notice. Notre Dame was not merely recreated; its interior was piled with weaponry and livestock just as it would have been in 1793. On its release in late 2014, the game came in for criticism not only for the unimaginative plot and the glitches in gameplay but also for its historical bias. The French Left was certainly not amused. Euro-MP and former presidential candidate Jean-Luc Mélenchon gave a TV interview in which he denounced Ubisoft’s portrayal of the French people as bloodthirsty savages and Robespierre as a monster. But since he also described Marie-Antoinette as a “cretin” perhaps the problem wasn’t so much bias as the wrong bias? In search of a more balanced verdict, the Nouvel Observateur approached the handsome academic historian from the Sorbonne Guillaume Mazeau. Guillaume was not too fazed by the obvious anachronisms and admired all the detail – for instance the inclusion of Louis XVI’s actual speech to the Estates-General – though he too was upset by the violence of the crowd. Personally, I think everyone is worrying unnecessarily. If you don't like gratuitous violence, you don't play Assassin's Creed! The average gamer knows full well that the behaviour of the crowds is nothing to do with historical accuracy – it is dictated by the needs of the gameplay. 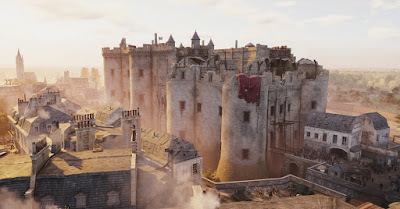 The most discerning critics point out that Ubisoft has in fact done very little to integrate the plot of the game with its historical location in any sophisticated way - the assassin is just plonked in 18th-century France with the same old killing mission. Assassin's Creed Unity is not educational and its is not history; it is just a computer game with some first-class graphics to enjoy. Steve Dent, "Exploring modern Paris to find the roots of Assassin's Creed Unity", Engadget.uk, 6 Oct.2014.